This fluffy faux fur rug provides elegance to your home, soft and silky fur will be a great decoration in any room. Wash the Rug with the machine set on the gentle or delicate setting, using cold water (less than 30 degrees). Add a small amount of mild or all-natural detergent. Shake it to fluff up the faux fur when take out the faux fur item. Lay rug out or hang to dry naturally without direct heat or sun. Choose a site that's well ventilated for air drying. Brush and fluff up the faux fur, using a care brush with widely spaced metal bristles. Faux Sheepskin Fur which could make you or your baby feel more comfortable. Not only does it promise sublime underfoot comfort, but it would make the perfect legance and class touch and great decorative to any room. Perfect area rug for family room, living room, and bedroom. Come and beautify your home interior with this extremely soft sheepskin rug now! 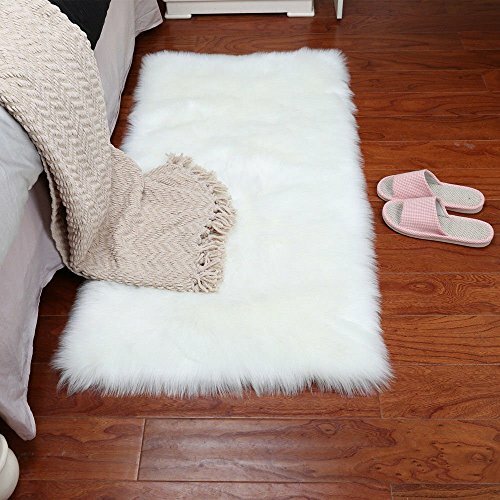 Sheep skin, Natural Fiber, Clean and eco- friendly, Long-lasting, Wonderfully soft, fufade resistant, keep warm during cold winter weathers and Great decorative rug for any bedroom give a warm and cosy feeling. If you have any questions about this product by WYR, contact us by completing and submitting the form below. If you are looking for a specif part number, please include it with your message.